Here's a reduced-fat, baked version to a finger-food favorite! Preheat oven to 350 degrees F and position rack in upper third of oven. Line a baking sheet with foil and spray lightly with cooking spray. Remove cheese from packaging and set aside. In a small bowl, whisk egg until foamy. In a small non-stick skillet, mix Italian seasoning with bread crumbs and place over medium-heat. Cook and stir bread crumbs until lightly browned, about 5 minutes. 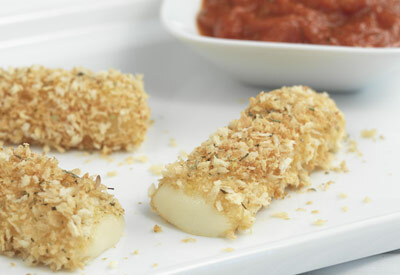 Dip one piece of string cheese in egg until coated and then into toasted bread crumbs, coating completely. Redip the string cheese in egg and again in bread crumbs, if desired. Place on baking sheet. Repeat with remaining string cheese and place on baking sheet 1 1/2- inches apart. Spray string cheese lightly wth cooking spray. Bake 5 to 6 minutes or until heated through. Note: Cheese may melt slightly and loose shape; simply press back into place. Serve with warmed marinara sauce for dipping. $3.00 OFF on ONE (1) Pampers® Cruisers Diapers Product (excludes Cruisers 360 FIT Diapers). Dealer: Submission to Procter Gamble signifies compliance with 'Requirements for Proper Coupon Redemption.' Please visit this link for coupon terms for proper redemption: http://www.pg.com/en_US/downloads/partners_suppliers/PG_Coupon_Terms_of_Proper_Redemption.pdf. Limit of one coupon per item. Consumer: Limit ONE coupon per purchase of products and quantities stated. Any other use constitutes fraud. Coupons are not authorized if purchasing products for resale. You may pay sales tax. Not valid in Puerto Rico. Save $5.00 on ONE Swiffer Sweep Vac OR Steamboost Starter Kit (excludes trial/travel size). Dealer: Submission to Procter Gamble signifies compliance with 'Requirements for Proper Coupon Redemption.' Please visit this link for coupon terms for proper redemption: http://www.pg.com/en_US/downloads/partners_suppliers/PG_Coupon_Terms_of_Proper_Redemption.pdf. Limit of one coupon per item. Consumer: Limit ONE coupon per purchase of products and quantities stated. Any other use constitutes fraud. Coupons are not authorized if purchasing products for resale. You may pay sales tax. Not valid in Puerto Rico. Limit of one coupon per household. Digital Coupons and paper coupons may not be combined on the purchase of a single item. Specially marked items, such as Clearance or Manager's Specials may not be eligible for Digital Coupons. Our TOPS In Education program makes it easy to get money for school improvements and programs.